Unionist leader Arlene Foster was notable by her absence at the all-island Brexit conference in Co Louth. However, her distinctly anti-EU point of view was well represented when remarks she'd made about the EU's lead negotiator, Michel Barnier, were put to him for a response. Ms Foster had earlier in the morning described the particularly mild-mannered former French minister as "aggressive" and "does not understand" the unionist history or position in Northern Ireland. She said he pretended to understand the issues but was "not an honest broker". "Michel Barnier's trying to present himself as someone who cares deeply about Northern Ireland and if that is the case he needs to hear the fact that we are part of the United Kingdom; will remain part of the United Kingdom constitutionally, politically and economically," she told the BBC. "Therefore, his proposal of us being in an all-Ireland regulatory scenario with a border down the Irish Sea simply does not work." It didn't matter to Ms Foster that nobody has ever suggested there should be a border down the Irish Sea; and that the whole point of dialogues and conferences such as the one Ms Foster declined to attend would be the ideal platform to express misgivings. And perhaps constructive solutions to a situation of deepening impasse which threatens a bitter return to identity politics in the North. The former French minister who served in several portfolios responded by saying he didn't wish to engage in "polemics" with Ms Foster. He said while he "profoundly regretted" Brexit, he was "never aggressive" nor did he behave with any "spirit of revenge". 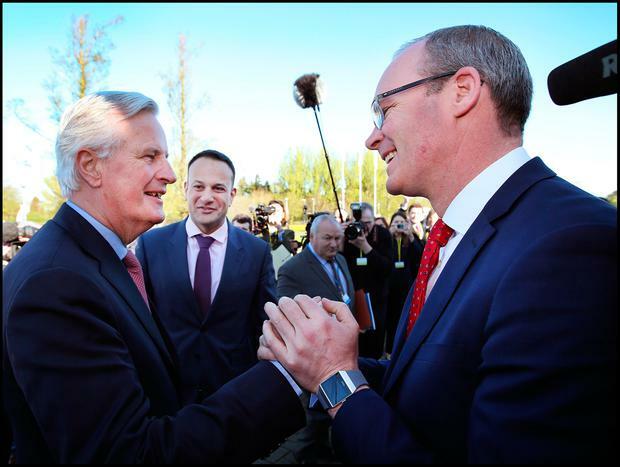 As the lead negotiator for the EU 27, Mr Barnier has - and continues to have - almost complete support from every Irish stakeholder in Brexit, including cross-party recognition, as well as from business and civil liberties groups. Their presence reflected this. Welcoming Mr Barnier, Taoiseach Leo Varadkar and Tánaiste and Foreign Affairs Minister Simon Coveney - the two most senior government ministers - thanked him for this "very real understanding at the heart of the EU of the serious challenges presented by Brexit to Ireland". While there was a relatively optimistic tone - notwithstanding the fact that there was no input from the unionist side - one couldn't help feeling discussions were happening in a vacuum. The Taoiseach appeared to rally troops by pointing out that yet another bruising round of brinksmanship is looming large, and to get ready. We would be at another "decisive point again in a few weeks' time", said Mr Varadkar. In attempting to appease the fears of an already Brexit-weary population, Mr Barnier said the EU wouldn't allow talks to continue with the UK unless there was "substantial progress" on the Border by June. However, it remains unclear what exactly this threshold looks like, and what substantial progress means. The Irish Government's position is resigned to focusing on getting the British government to come up with a satisfactory interpretation of the backstop - or Option C.
This is where the North would remain within the customs union and effectively the single market in the increasing likelihood that Option A - a comprehensive trade deal and closer than close relationship - can't be thrashed out. Mr Barnier cautioned about the "real risk" that this outcome is to be expected: "We have to be prepared for all options including no deal. It is not my preference." He said he was "not optimistic" and "not pessimistic" but "determined" that the two sides can break the deadlock. The Tánaiste pointed to the impossible scenario where the UK believes it can stay outside the customs union and single market and expect the EU and Ireland to evade long-established rules of the single market - most of which Britain was instrumental in creating - in order to satisfy misguided Brexiteers' fantasies. "The British government has red lines all over the place and expects the EU to accommodate them. We have red lines, so does the EU, but nobody seems to focus on that," Mr Coveney said.